Your garage door keeps intruders from accessing the house. During extreme weather conditions such as snow or heavy rain, you can rely on a well-functioning garage door to keep the elements from your home. There are so many different things that could go wrong with your garage door. For it to function optimally there needs to be synchrony in the running of the small components in the entire system. Here are some of the crucial parts of a garage door and why they need urgent care and repair once they malfunction. When the rails are bent or detached from the rollers, then there is cause for worry. This needs to be checked as it can result to having the garage door open off track. If the tracks are clogged with fragments, the rollers will not move as they should. This will result in the garage door failing to close fully. Instead, it will open upon only closing half way. Clean the tracks from any debris to avoid it getting stuck. You may also want to lubricate the hinges too. Have the track’s alignment checked regularly. Broken garage door springs or even a single spring will make it hard for the garage door to open. The door will pose a great hazard in your home if not repaired promptly once a spring loses its tension. You can have torsion spring conversions done effectively by a professional to give you peace of mind. The springs can get damaged as a result of wear and tear and changes in weather conditions over the years. 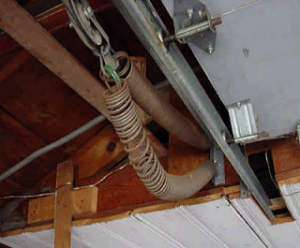 The tension springs could make the garage door to sag if they are not working properly making it risky to use. Garage door openers also tend to fail and a replacement is not always necessary. Some of the problems include having the wall switch not close the door or remote completely fails to work. 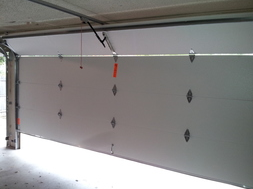 Having it repaired, adjusted or if need be replaced, the garage door will running normally in no time. Physical injuries to the garage door whether accidentally by a car or by the kids could cause bigger injuries than those perceived. For this reason, they should not be left unchecked as it could cause a breakdown or serious injury in future. 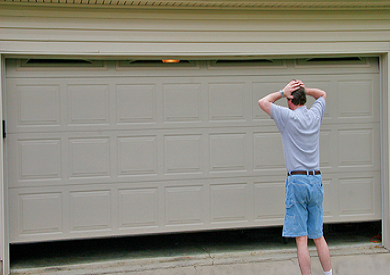 Never ignore the unusual and consistent noise made by your garage door. It could be a number of parts such as the springs producing the noise and they need to be replaced. Despite having it seem to work properly, the noise could be an indicator of an underlying and soon to be a serious problem. A garage door that has been in use for years is bound to have age-related malfunctions. Having to repair and replace some of its parts every now and then could be an indicator that you need to change the garage door entirely. Updating the garage door system will also beef up your security and reduce the number or repairs you need and prevent a full blown problem in future. Also due to age and past injuries, the garage door may have some cracks on the wooden parts of the door. This is usually because of rotting which has occurred during the years and it is usually worse than it looks. When the garage door is not closing, it could be due to a problem with the garage door’s photo eye. If the photo eyes are broken or not aligned, it will have an effect on how the door closes. Taking care of them should include regular cleaning and ensuring that the eyes are intact. If the door won’t budge the garage door metal track misalignment could be the reason behind it. You can fix this or have it checked by a professional otherwise, it could cause bigger long term problems for your garage door. This will require you to have a look at the transmitters particularly the transmitter’s frequency. A change in the garage doors opening and closing speed could mean that something is wrong. For repairs, have a look at the control panel as well as the garage door opener. If something is wrong with your garage door, it will affect the cooling and heating system inside the house. This affects the home’s energy system hence your higher than usual utility bill. Repairing malfunctions as soon as they occur will help keep your door running for longer. Additionally, also have the garage door serviced and tuned up by a professional. This will what’s more, prevent some of the common garage door malfunctions and keep your door working smoothly hence keeping you from any inconveniences. Having repairs done early enough will eliminate the need to have your entire garage door replaced. An extremely worsened malfunction of the door will make it hard even for experienced mechanics to repair and it can cause you the entire door. This will cost you both time and money. Doing repairs if you are not sure of how it should be done could lead to injuries. Go through the garage door manual carefully before commencing any repairs or maintenance work. Also, do not use force to try and make the door to work or put your hands in the joints or springs to avoid getting hurt. Additionally, work on it while the door is pulled down and if you are working on the garage door openers, have them unplugged first. Although having it checked by a professional will give you peace of mind, some of these repaired you can do on your own. All you have to do is understand what has failed in the door system and have the correct tools. A faulty garage door can cause serious injuries and at the same time compromises the security of your garage. It is therefore, preferable to have them repaired on the same day as when you realize that there is something wrong. 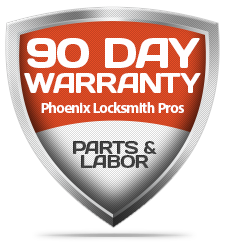 If you need garage door repair, don’t hesitate to call Phoenix Locksmith Pros today!